The largemouth bass is the king of Texas game fish. The state record of 18.18 pounds was caught from Lake Fork in 1992. 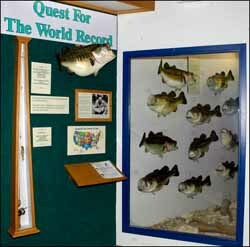 This exhibit features replicas of the largest bass ever caught in Texas; the former world and current state record blue catfish, Splash; and state record fish of other species. Splash weighed 121.5 pounds when caught from Lake Texoma in January 2004. She lived in the dive tank at the Texas Freshwater Fisheries Center until her death in December 2005.